Nov. 10, 1975 the freighter Edmund Fitzgerald sank in a storm near Whitefish Point, Michigan. The "Fitz" as she was known was laid down as hull# 301 at the Great Lakes Engineering Works in Ecorse, Michigan. At 729 feet long and weighing just over 13,000 tons, the Fitz would be the largest freighter on the Great Lakes until 1971. Before her final voyage she had been involved in several minor accidents, colliding with another ship (the SS Hochelaga) and with the Soo Locks on more than one occasion. In 1971-72, she was converted to an oil burning ship. Soon after the conversion Ernest McSorley was made Captain. On Nov.9, Fitz departed Superior, Wisconsin loaded with 26,000 tons of taconite pellets. At around 2:40 pm Capt. McSorley sighted the freighter Arthur M. Anderson some 15 miles astern of them, also around this time a gail warning was posted by the weather service. Around 3:30 pm the Fitz radioed the Anderson that he had some damage to the top side of the ship and had taken on a list. By 4:40 McSorley reported he had lost all radar systems on the Fitz. Around 7:10 the Anderson asked the Fitzgerald "how are you making out with your problem?" the Fitzgerald replied "we are holding our own." That was the last transmission sent by the Fitzgerald. At 7:25 pm the Fitzgerald vanished from the radar screen of the Anderson. At around 7:55 the Anderson signals to the Coast Guard that they have lost contact with the Fitzgerald. Because of the storm the Coast Guard had no available search ships, so the Anderson was asked to return and search for survivors. Even though the Capt. was very reluctant he agreed to return, no survivors were found. All 29 men were lost. 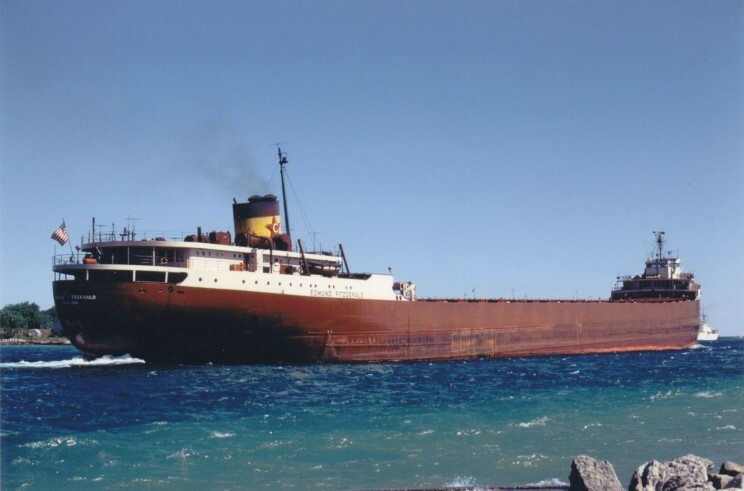 This story was immortalized by Gordon Lightfoot and his song "The Wreck of the Edmund Fitzgerald" in 1976. In May of 1976, the wreck was positively located at the bottom of Lake Superior. Broken in half but well preserved, many dives were made on the Fitz. Even Jean Michel Cousteau came to the Fitz in 1976. The ship's bell was raised in 1995 and is now at the Great lakes Shipping Museum. In an eerie scene when the bell was raised it rang as soon as it broke the surface.